One of the most popular game shows on television, "Jeopardy" has stimulated minds with facts and trivia for years. 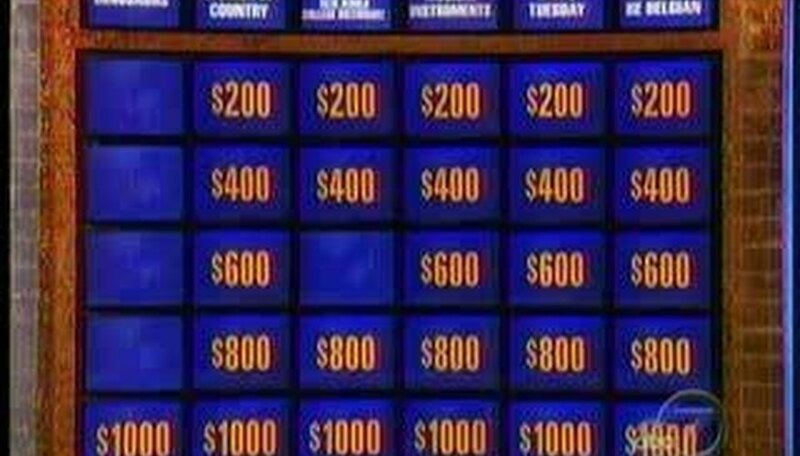 Whether as a learning tool or a way to show off your trivia knowledge, bringing "Jeopardy" to your home can be as simple as a few poster boards and a couple of friends to play with. Create a questions board, like the panel of television on the game show. To make this, divide a poster board into six even rows and six even columns with a marker. Find the questions and answers to 30 trivia questions for one round of play. There should be five questions for six different categories. Write the questions (in the form of answers) on one side of 30 different index cards. Record the questions and answers on a key for the "host" to keep. Write the money amounts--$200, $400, $600, $800 and $100--on the reverse of the index cards. Place the index cards, question side down, money side up, on the game board. They should be in ascending order and under the proper categories. Assemble at least two players and one host to give the answers.